Antique, Vintage, Modern All About Collecting, Identifying Dolls - Below are some doll reference books with cover photos, detailed descriptions, original retail price value, authors names, etc. that may be useful in a keyword search, many of the books are Out of Print and have now become collector items themselves. 200 Years of Dolls, 4th edition book by Dawn Herlocher, Identification and Price Guide, excellent reference resource of 275 doll manufacturers antique to modern, many color photos, values, a DVD with 2,000 doll markings included. Publisher by Krause Publications, 4th edition, 2009, 400 pages, paperback, retails $32.95. Arranbee Dolls, Identification & Value Guide book by Suzanne L. DeMillar and Dennis J. Brevik, R & B Dolls that sell on Sight, 650 color photos, descriptions, value guide. Publisher Collector Books, copyright 2003, paperback, 224 pages, Retail $24.95. Out of Print. Barbie Closet book by Patricia Long, price guide for Barbie & Friends, Clothes Fashions, Accessories; 1959-1970, more than 750 full color photo's, pricing for 4,000 accessories, what's unique to this book is that each item is individually priced instead of as a complete outfit. Publisher Krause Publications, copyright 1999, 350 pages, hardcover, Retails $34.95. Out of Print. Barbie Fashion book, Volume I 1959-1967, by Sarah Sink Eames, the complete history of the wardrobes of Barbie doll her friends and her family with values, 251pages. Retails, $24.95, Publisher Collector Books, hardcover, Copyright 1990-1999. Barbie Fashion book, Volume II, 1968-1974, by Sarah Sink Eames, the complete history of the wardrobes of Barbie doll her friends and her family with values, 327 pages. Retails, $24.95, Publisher Collector Books, hardcover, Copyright 1990-1999. Barbie Fashion book, Volume III, 1975-1979, by Sarah Sink Eames, the Complete History of the Wardrobes of Barbie Doll, her Friends, and her family with values, 208 pages, 600 color photos; Fashions are Best Buy, Fashion Originals, Superstar, Get-Ups 'N Go, and International Issues. Available November 2003. Retails $29.95, Publisher Collectors Books, hardcover, Copyright 2003. Barbie in Japan book by Keiko Kimura Shibano, all about Barbie and Francie 1960s fashions comparing the Japanese versions to the US produced outfits, 144 pages, hardcover. Retails, $25.95. Publisher Hobby House Press or Murat Caviale Inc., copyright 1994. Out of Print. Francie & Her Mod, Mod, Mod, Mod World of Fashion book by Joe Blitman, Francie doll fashions, price guide, 1967-1972. Published by Hobby House Press, copyright 1996, 160 pages, paperback, Retails $19.95. Out of Print. Skipper, Barbie Doll's Little Sister book by Scott Arend, Karla Holzerland, Trina Kent, Identification and Value Guide 1964-1978, 1st Edition, Barbie dolls little sister Skipper, also featuring 1967-1980 Tutti and Todd their tiny twin younger siblings. 226 pages, paperback. Retails, $19.95. Publisher Collector Books, copyright 1998. Out of Print. Skipper, Barbie Doll's Little Sister book by Scott Arend, Trina Cottingham & Karla Hemingway, 2nd edition in 2010, new updated book, includes 16 extra pages not in 1st book 1964-1978 Skipper and 1967-1980 Todd and Tutti. Publisher Collector Books, 242 pages, copyright 2010, paperback, Retails $24.95. Blue Book of Dolls & Values, 16 volumes in series by Jan Foulke, doll values from Antique to Modern, plus photos and descriptions. Publisher Hobby House Press, paperback, 16th book; 356 pages, copyright 2003, retails $29.95. Ms. Foulke has authored other books; China Doll Collecting, copyright 1996, paperback, 95 pages, Retail $9.95. Doll Buying and Selling, German Dolly Collecting book. Bawdy Bisque & Naughty Novelties, Identification & Value Guide by Sharon Hope Weintraub, published by Schiffer book for Collectors, copyright 2004, 208 pages, paperback. Naughties; Nudes & Bathing Beauties; German Bathing Beauties and their risqué kin book, Identification & Value Guide by Sharon Hope Weintraub, published by Hobby House Press, copyright 1993, 112 pages, 184 prints 66 in color, paperback. Canadian Dolls; The Charlton Standard Catalog book by Evelyn Robson Strahlendorf, 1st Edition copyright 1990, 2nd Edition copyright 1992 cover shown, 384 pages, 500 more dolls than 1st edition, black and white photos, dolls listed by manufacturer, doll name, size description, markings and value. paperback, Retail US $17.50, CAN $19.95. Cloth Dolls 1920s-1930s book, Identification & Price Guide by Polly Judd, published by Hobby House Press, copyright 1990, paperback, 256 pages, Retails $12.95. Also the author of; Composition Dolls Volume I & II, Hard Plastic Dolls Volume I and II. Collector's Encyclopedia of American Composition Dolls 1900-1950 book Volume I, by Ursula R. Mertz, Identification and values, 256 pages with 850 color prints identifying composition dolls from this era, hardcover. 1st issue 1999, reissued 2006, Retail $29.95. Collector's Encyclopedia of American Composition Dolls 1900-1950 book Volume II, by Ursula R. Mertz, Identification and values, 397 pages, filled full of color prints identifying composition dolls from this era, hardcover and a companion book to volume I. Copyright 2004, Retail $29.95. Collector's Encyclopedia of Dolls book Volume I (2,000 dolls), by Dorothy, Elizabeth and Evelyn Coleman, 1st edition, featuring 697 pages. Identification, markings, a huge and valuable resource for Antique dolls. Copyright 1968, hardcover, out of print. Collector's Encyclopedia of Dolls book Volume II (3,000 dolls), by Dorothy, Elizabeth and Evelyn Coleman, 1st edition, featuring 1,266 pages. Identification, markings, a huge and valuable resource for Antique dolls and a companion book to volume I. Copyright 1986, hardcover, out of print. Collector's Encyclopedia of Half Dolls book, by Frieda Marion & Norma Werner, 1979, Published by Crown Publishers, features 608 pages of information about half dolls by Dressel & Kister, Goebel, Karl Schneider and others, with black and white photos and some in color. Copyright 1979, Hardcover, out of print. Collector's Encyclopedia of Vogue Dolls book, Identification & Value Guide by Judith Izen, 1st Edition 1400 photos, 2nd Edition 2004, 1600 color photos, Ginny and Family plus many other dolls, 384 pages, hardcover, Retail ?? Collector's Guide to Ideal Dolls book, Identification& Value Guide by Judith Izen, 1st Edition 1993, 2nd Edition 1998, featuring 352 pages, 750 photo's, 1907 to1985 all about Ideal dolls, paperback. Retails, $24.95. A third edition is available 2004, 384 pages. Collector's Guide to Dolls of the 1960s-1970s book by Cindy Sabulis, Volume I & II, Identification and values, featuring; Chatty Cathy, Patti Playpal, Thumbelina, Krissy, Tressy, Liddle Kiddles, Ideal's Crissy & Harmony, Mattel Rockflowers, Topper's Dawn, World of Love Dolls. 600 photo's, 50 original catalog pages, 280 pages, paperback. Retails. $24.95. Composition Dolls 1909-1928 Volume II book by Polly & Pam Judd, Identification & Price Guide, 258 pages, 303 photo's, copyright 1994, hardcover, retails $25.00. Compo Dolls 1928-1955 Volume I book by Polly & Pam Judd, Identification & Price Guide, 208 pages, copyright 1991, hardcover, retails $25.00. Doll Makers & Marks book by Dawn Herlocher, Antique Traders guide to doll Identification and markings, tons of manufacturer's company profiles, doll mold marks, lists of doll sizes and names and much much more, a huge resource for collectors. Published by Krause Publications, copyright 1999, paperback, 398 pages, retails $29.95. Dolls of Jules Nicholas Steiner book by Dorothy A. McGonagle, History, identification, many (80) color, black and white photos, 240 pages, Publisher Hobby House Press, Inc., copyright 1988, 2nd printing 1996, hardcover. In print. Encyclopedia of Celebrity Dolls book by John Axe, more than 1,500 dolls identified, 1,069 photos, 750 biographies, 412 pages. Retails $29.95, published by Hobby House press, hardcover, copyright 1983. Out of Print. Encyclopedia of Bisque Nancy Ann Storybook Dolls Volume I; Identification & Value Guide by Pardee, covers 1936-1947, cover not shown, 368 pages, 1,500 color photos, published by Collector books, copyright 2003, paperback. Encyclopedia of Nancy Ann Storybook Doll book Volume II; Identification & Values Guide by Elaine M. Pardee, cover shown, 400 pages, color photos, published by Collector Books, copyright 2009, paperback. 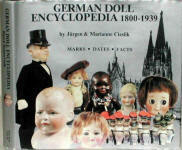 German Doll Encyclopedia 1800-1939 book by Jürgen and Marianne Cieslik, all about identifying German dolls, dates, marks, facts, 356 pages, published by Hobby House Press, copyright 1985, hardcover. Retails $49.95 Out of Print. German Doll Marks and Identification book by Jürgen and Marianne Cieslik, 183 pages of antique German doll marks, published by Hobby House Press, copyright 1st edition 1986 or 2nd edition 2001, paperback. Out of Print. Hard Plastic Dolls Volume I, Identification & Price Guide book, 2nd Revised edition by Polly & Pam Judd, 302 pages of hard plastic dolls made between 1946-1959, 600+ photo's, published by Hobby House Press 1985, 1987 & 1990, paperback, retails $12.95. Out of Print. Hard Plastic Dolls Volume II, Identification & Price Guide book by Polly & Pam Judd, 256 pages, a supplement to volume I, 431 photo's, published by Hobby House Press 1989, paperback, retails $12.95. Out of Print. Horsman Dolls 1865-1950 book, by Don Jensen, Identification guide, hardcover, 200 pages, many photos and descriptions, copyright 2002. Retail $ 29.95. Out of Print. Horsman Dolls 1950-1990s book by Don Jensen, Identification & value guide, hardcover, 240 pages, many color photos and descriptions, copyright 2007. Retail $ 29.95. Liddle Kiddle Dolls and Accessories book by Tamela Storm, Debra Van Dyke, 175 pages, Publisher Collector Books, copyright 1986, paperback. Out of print. Liddle Kiddles book by Paris Langford, also; Dolly Darling, Flatsy, Upsy Downsy, Totsy Dolls 1965-1971 Identification and Value Guide, Publisher Collector Books, paperback, 237 pages copyright 1995, retailed $18.95. Out of Print. Modern Collectible Dolls Volume I; Identification & Value Guide book by Patsy Moyer, several different book volumes beginning in 1997, published annually on various modern dolls. number of pages vary per book, Published by Collector Books, hardcover. Ultimate Doll Book by Caroline Goodfellow, 400 dolls from the wooden peg dolls of the 18th century, adorable 19th century bisque babies and 20th century cloth cartoon characters, to ethnic and fashion dolls from Pierotti to Barbie. Published by Metro Books, copyright 2001, 160 pages, hardcover, retails, $24.95. Out of Print.